“Iʼm still on my back but getting stronger each day. . . . It will be good to be on the team with you." William Orville Douglas, 1898-1980. Associate Justice, Supreme Court of the United States, 1939-1975. Autographed Letter Signed, Bill, one page, 5¾" x 9", on engraved stationery of the Supreme Court of the United States, Washington, D.C., October 20, 1949. 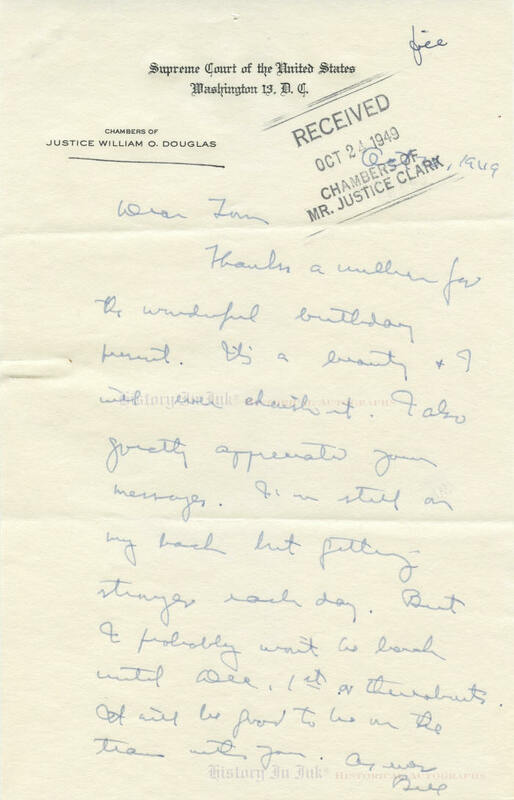 Douglas thanks Justice Tom C. Clark for a birthday gift and reports on his condition after a suffering a serious accident while horseback riding high in the Cascade Mountains in Washington state. He writes, in full: “Thanks a million for the wonderful birthday present. It's a beauty & I will ever cherish it. I also greatly appreciate your messages. Iʼm still on my back but getting stronger each day. But I probably won't be back until Dec. 1st or thereabouts. It will be good to be on the team with you. As ever . . . ."
Douglas, an avid outdoorsman, suffered 13 broken ribs and a punctured lung on October 2, 1949, while horseback riding with one of his close friends near the summit of Chinook Pass, some 85 miles northwest of Yakima, Washington. Douglas stopped on the narrow, rocky trail to cinch up his saddle. Something frightened his horse as he was remounting. The horse reared up, threw Douglas, and then rolled over him as they both plunged some 20 feet down the rocky mountainside to a trail below. Douglas laid on the ground for more than an hour until medical personnel arrived to remove him by stretcher. Doctors in Yakima immediately gave him blood transfusions, and x-rays showed that Douglas had eight broken ribs on his right side and five on his left. Bones punctured his right lung and deflated it. Later reports said that Douglas broke 14 ribs, not 13. In this letter, Douglas was overly optimistic about his return to the Supreme Court. Although he predicted that he would return around December 1, 1949, he actually did not return to the bench until March 27, 1950. As Douglas notes, his return marked the first time that he would sit with Clark, to "be on the team" with him, on the Supreme Court. President Harry S. Truman nominated Clark on August 2, 1949, to fill the vacancy left by the death of Justice Frank Murphy, and the Senate confirmed him as an Associate Justice on August 18. Clarkʼs appointment thus occurred during the Courtʼs traditional summer recess. The Court convened to begin its 1949 Term on the first Monday in October, the day after Douglas's accident. Douglas has penned this letter and signed it in blue ballpoint. The letter has two horizontal mailing folds and Clarkʼs chambers receipt stamp, which affects Douglasʼs handwritten date. Someone has underlined Douglas's printed name on the letterhead in black, and there is a file notation in another hand in the blank margin at the upper right and a pinhole in the upper center. Overall the letter is in fine condition. Provenance: This letter comes from the personal collection of Justice Clark, who served on the Supreme Court from 1949 until 1967. Justice Clark collected the autographs of other Supreme Court Justices dating back into the 19th Century. We are privileged to offer a number of items from the collection.